Jørgen Ejbøl started his career in journalism with the Aalborg Stiftstidende newspaper. From 1976-1993 he served as editor and editor-in-chief on various newspapers in Denmark such as Fyens Amts Avis, Dagbladet, Weekendavisen Berlingske Aften, BT, Billed Bladet, and Berlingske Tidende. From 1991-1993 he was editor-in-chief and managing director of JydskeVestkysten. In 1993, Ejbøl became editor-in-chief and managing director with Morgenavisen Jyllands-Posten, followed, in 2003, by his appointment as chairman of the board of JP/Politiken Newspapers Ltd., (Jyllands-Posten, Politiken and Ekstra Bladet). 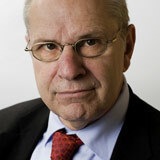 As of 2008, he is Vice Chairman of the Jyllands-Posten Foundation. From 2005 Ejbøl has held managerial positions in several media organizations in Denmark and abroad, like APM Print & Trans Press, (Belgrade, Serbia & Montenegro), Alta Press, Barnaul, (Russia) and Sermitsiak.AG (Denmark/Greenland). From 2005-2008 Ejbøl was a member of the UNESCO World Press Freedom Prize. From 2005-2011 The Danish Egyptian Dialogue Institute.